GAME AMMUNITION. Perfection is a rare thing. It's not easily attained. But when you see it, you know it. And the Remington® exclusive Ultra Mag system has got it. It's what happens when the leader in ammunition and gun design creates a new breed of cartridge for one of the world's most accurate guns ... the Model 700.™ The result is a gun and ammunition system that continues to revolutionize big game hunting. 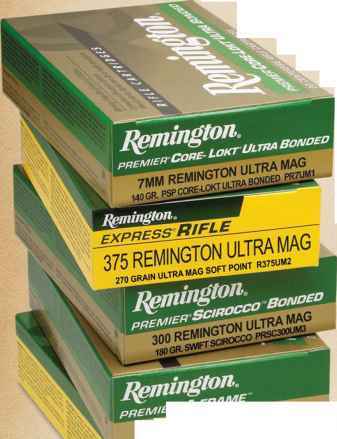 The incredible performance of the Remington Ultra Mag cartridges comes from the innovative case design. The result is a "non-belted magnum" with a larger case diameter which allows for dramatically increased powder capacity, more overall power, and better accuracy due to precise bore alignment. The Remington Ultra Mag family of cartridges produces the highest velocities, the flattest trajectories and the most energy within their respective calibers.